EAT+SLEEP+MAKE: Guest Posting at Me Sew Crazy! So confession: Shannon and I rarely work on projects together. It's not that we avoid it or anything, plus we live right down the street from each other so we don't have that excuse. The truth is we both get wrapped up in our own projects and lives that, by the end of the week, all we want to do is relax and have a scary movie night. They are glorious. And Golden Oreos are usually involved. But, we finally did it! And it was SO much fun! Shannon and I share a love of creativity, but each of us has our own separate strengths. As I'm sure you've noticed, Shannon is an amazing artist (you can see one of her original drawings in DIY wood matting tutorial), and I love to sew. 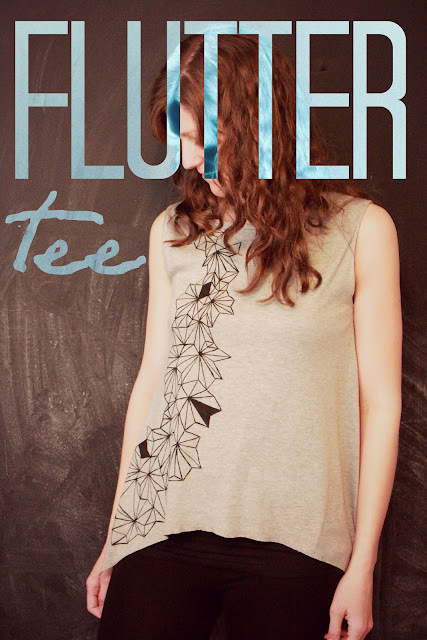 We thought it'd be fun to combine two of our talents into one project - and the result is this flutter top! Why did we ever wait this long to work together?? We hope you like it! We plan on working together a lot more on projects and making it a regular thing here on our blog. P.S. Jess is crazy talented (as I'm sure you already know,) and she also has some fantastic patterns in her shop. If you're not already, you definitely need to follow her blog and pick up a few of her patterns while you're at it!